Order your Silver Star China Panda Coin Cufflinks today from FahrneysPens.com. Fine Pens, Refills & Luxurious Gifts – great prices & fast shipping. Authentic Chinese coins are hand-painted by a family of artisans using secret lacquering techniques handed down through generations. The firing process makes each one a unique treasure that’s a perfect balance of function and art. 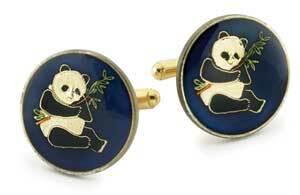 The Chinese Panda coin cufflinks with silverplated fittings are a fine gift – to give or receive!